Need a Map of Tulum and a Brief Tulum Ruins History Lesson? Just south of Cancun is the city of Tulum, a hub of Tulum Ruins History, cenote water holes and nature preserves, quirky street art, and the turquoise waters of the Caribbean Sea. When you are spending time in beautiful Cancun, Mexico, make sure you book a trip to Tulum. This Yucatán Peninsula city was once a thriving Mayan seaport. Today, it is a bustling locale with many tourist attractions including multiple ruins sites, natural reserves, beautiful beaches, and so much more. Let’s paint a map of Tulum and take a walk through this vibrant city and get a brief history of its culture. One of the most popular sights of Tulum is the Tulum Ruins. This area was occupied by the Mayans from around 1200 AD until the 15th century. According to Tulum ruins history, when the Spanish came to Central America, the inhabitants of this civilization eventually fled to the surrounding jungle and lived there for over 300 years. During that time, the Mayan civilization was enveloped by the jungle, but after its discovery in the early 1800s these astounding structures were uncovered and restored to their beauty and strength we see today. You can tour the Mayan civilization on your own and definitely enjoy its splendor, but a guide can give you so much more history of the ruins, their people, and its culture. 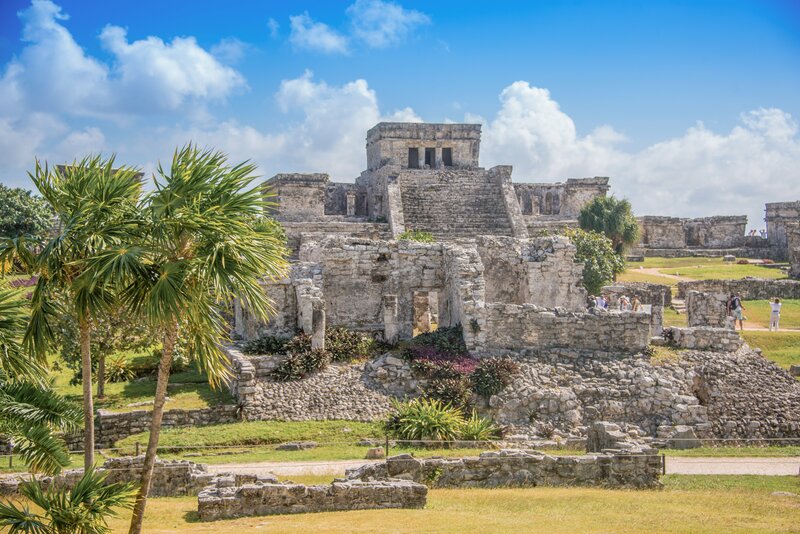 In addition to the Tulum ruins history, Latin American history buffs will love the Tulum area for its abundance of other Mayan civilizations that can be explored. Just north of the city of Tulum are the Cobá Ruins. You can travel the miles of white roads as you ponder the experiences of the people who trod these same pathways. At Cobá, you can also climb the 120 step temple which was the center of the civilization. 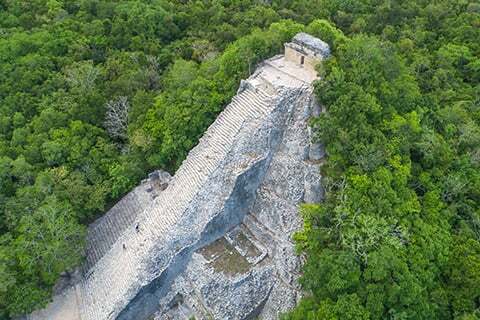 The Muyil Ruins, also known as Chunyaxché, are approximately 25 km (9.3 miles) south of Tulum. As with Cobá, it is not as heavily visited by tourists, so it is a bit more peaceful and you can enjoy the sanctity and spirituality of the area. Located within the Sian Ka’an Biosphere Reserve, it is a wonderland of well-maintained paths and awesome structures that are still standing, as well as being famous for the canal system that was built by the Mayans. Also on our map of Tulum, you will find a breathtaking nature reserve. You may want to set aside a separate day to visit Muyil while viewing the wonders of nature at Sian Ka’an Biosphere Reserve. This reserve is made up of dunes, lagoons, beaches, and protected ecosystems that will stun and amaze. There is something for everyone to do here: hiking, sunset bird watching, snorkeling, and other physical adventures. If you want to learn more about the Mayan culture, ask our tour booking representative to reserve a spot for you on the Ancient Mayan Route boat tour that travels the canals built more than 1,000 years ago. Wear your swim gear as you tour the Tulum Ruins in the morning, then head to Tulum Ruins Beach for a refreshing swim, or just makes this your destination for a day. Sometimes called the Mayan Beach, it is considered to be one of the most beautiful beaches in Riviera Maya. The waters are crystal clear turquoise and the sand is soft. It is a small beach, so it can fill up at peak times, but it is an absolute must for lovers of the Caribbean. If you are visiting Tulum on a private tour you will have the opportunity to witness the ancient spectacle of the Voladores. These amazing acrobats are five costumed men who perform stunts and dancing atop a pole at heights of almost 46 m (150 feet). The Dance of the Flyers is based on rituals of the Totonac Indians and will thrill and amaze. Tulum has a rich history, culture, sun, sea, food, drink, and so much more. Book your sightseeing and Tulum coastal adventures by contacting Cancun Adventures today.